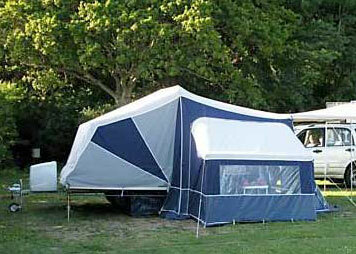 Insurance for trailer tents and for folding campers is provided under our touring caravan policy. Compare cover and compare price with our easy trailer tent insurance quote. 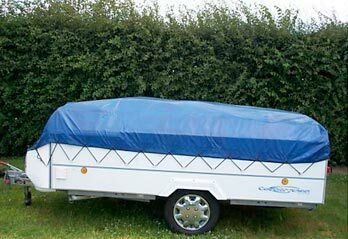 Not sure if you have a trailer tent, folding camper or folding caravan? Well it doesn't matter at all as our acceptance criteria, premium rates and security requirements are exactly the same whatever category your trailer falls into. We have one quote system for rigid touring caravans and another for every other kind of non-rigid trailer that makes up into some form of caravan or tent. Our trailer tent coverage takes care of your camping needs. Your trailer tent, folding camper or folding caravan will be insured under our touring caravan insurance policy as a "touring caravan". All of the terms are exactly the same as for a touring caravan with one key exception. You cannot cover valuables, personal possessions or audio and visual equipment. This is because the insurance underwriter is concerned about the lack of inherent physical security under the canvas of a trailer tent or folding camper. We therefore suggest that you check to see what level of cover you have from your car insurance policy if you lock items into the car. Often this is inadequate and it is usually best to take out all risks "personal possessions away from the home" cover as part of your home contents insurance cover. Often this is already included but you need to check with your insurer and check if there are any exclusions which may be affected by your camping lifestyle. Download the Trailer Tent Insurance IPID. An easy to understand brief summary of cover.